Over the past 23 years, Whitson CM’s lead construction manager has constructed over fifty Caltrans projects as a project manager and construction manager. Whitson CM has constructed Caltrans projects as a construction manager, general contractor, and as a subcontractor. Recently, Whitson CM completed three freeway interchanges as a construction manager in San Diego, California. In each instance, Whitson CM acted as the project’s resident engineer and construction inspectors. On behalf of the owner, Whitson CM was able to create a set of specifications that allowed management of the contract per the owner’s contract guidelines, but per Caltrans’ technical specifications. Because of this format, we were able to control cost overruns and minimize the types and number of claims on this project. Understanding the technical and contractual specifications is essential to constructing a Caltrans project. Since Whitson CM has experience constructing Caltrans projects as both a contractor and as a resident engineer; we are able to address issues before costs are occurred. We take a very proactive role in developing a work plan so that the project runs smoothly, safely, and with minimal of delays. Freeway Interchange Reconstruction: Camino Del Norte at Interstate 15. This $13 MM interchange widened Camion Del Norte under and adjacent to Route 15. A combination of cast-in-place and tie-back retaining walls allowed the roadway to be widened 32 feet in each direction. In addition, this widening required relocation of dry and wet utilities, construction of a new storm drain system, ramp widening, traffic signals, overhead signs and other improvements. 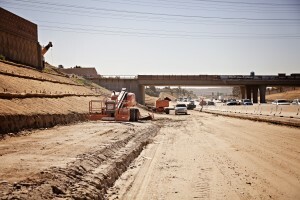 Interchange & Roadway Widening: Rancho Bernardo Road at Interstate 15. This widening was accomplished by constructing thirteen separate retaining walls of different types including CMU, CIP, Soil Nail, and Tie-back retaining systems. This project presented a variety of challenges including fiber optic relocations and protection, field design of a storm drain system to avoid conflicts with multiple utilities that could not be relocated, claims relating to shotcrete structural defects and shallow formational granite. Freeway Widening and Interchange Reconstruction: College Blvd at Route 78. This interchange project widened the Route 78 over-crossing at College Blvd and realigned all of the freeway access ramps. This $10 MM project required a variety of retaining systems including CIP, CMU, and grid-reinforced retaining walls. This project’s complexity was borne by a rushed design process to qualify for Federal funding. As a result, this project produced over 10 claims by the contractor and 127 contract change orders. Freeway Widening and Interchange Reconstruction: WB Route 78 at Interstate 5. This interchange project widened WB Route 78 from Jefferson to Interstate 5 including reconstruction of the I-5 NB ramp. Design changes throughout the construction of this project presented minor obstacles otherwise the widening when smoothly. Freeway Overlay and Median Improvements: Route 52 in Clairemont Mesa. A section of Route 52 in San Diego, California was constructed above a previous landfill. Over time the weight AC surfacing displaces fill materials not properly compacted and the freeway settles non-uniformly. A series of grinding and placement of AC leveling courses brought the roadway into alignment.